The hyper-competitive college admissions game can turn any high school student into an insecure, anxiety-ridden puddle. But what if kids spent their whole lives knowing exactly how they measured up, aware that every move could make or break their futures? That’s the scenario Lauren McLaughlin explores in her deeply compelling young adult novel Scored. In Scored‘s not-so-distant future, a computerized surveillance system ranks students according to their academic performance and selected social behaviors. High scores guarantee them college scholarships and stable jobs. The lower their scores are, the narrower their options. Imani LeMonde, a bright teenager from a working-class, mixed-race family, is exactly the kind of student who’s supposed to benefit from scoring. The system was created in the aftermath of a Second Depression that wiped out the middle class and made upward mobility virtually impossible. Merit-based scoring offers students access to higher education regardless of their income—though the rich can still buy their way into college if necessary. At the novel’s outset, Imani’s dream of going to college and becoming a marine biologist seems secure. But when her score plummets unexpectedly, she must choose between her future and her friendships. Soon, she begins to question the system she’s grown up with, asking whether scoring has only exchanged one form of inequality for another. Smart, socially-relevant young adult books are currently riding a wave of well-deserved enthusiasm on the success of The Hunger Games trilogy. Scored stands out from the crowd, interweaving a fast-paced plot with complex characters and thoughtful discussions of race, class, politics, and history. Author Lauren McLaughlin graciously agreed to talk to Girls Like Giants about her novel, which was published by Random House in October 2011. Read on for her thoughts on standardized testing, status obsession, and the secret ingredient for great young adult fiction. In Scored, Imani begins to question the standardized rankings and surveillance culture she’s grown up with. Do you think there’s a natural connection between dystopian stories and young adult fiction? How can young protagonists explore and challenge their societies in unique ways? I do think it’s very interesting that dystopian fiction is having a big moment right now with teens. Personally, I can’t help but speculate as to whether it may have something to do with the fact that we are living in very trying, even dystopian, times. Many aspects of our society are crumbling. Our economy has hit a brick wall and many believe our democracy itself is at risk of collapsing under the weight of extreme corruption. Perhaps the authors of dystopian fiction are hoping to channel the revolutionary inside every teenager in hopes of turning things around. I know I am. I sincerely hope today’s teenagers do a better job of managing society than we’ve done. We messed some things up. How did current events inform your depiction of the world Imani lives in? Did any personal experiences with standardized testing and surveillance influence the novel? I graduated from high school at a time when the standardized-test-taking experience was comparatively benign. Of course I got nervous taking the SAT’s, but back then (in the ancient eighties) college admission wasn’t nearly as competitive as it is now. I was very much influenced by the stories I heard of young people with good grades and real talents being kept out of college because of weak SAT’s and ACT’s. That seemed outrageous to me. I think we’ve become so obsessed with status and ranking that we’ve allowed it to warp the entire educational experience. Are there similarities between Somerton, the blue-collar Massachusetts town in which the novel takes place, and Wenham, the Massachusetts town where you grew up? Somerton is more similar to Essex Massachusetts, which was home to the marina where my Dad kept his boat. Geographically, I basically just used my exact memories of Essex to create Somerton then added bits and bobs here and there. But the socio-economic status of Somerton is entirely my creation. As far as I know, Essex is still doing quite well, whereas Somerton, as with the rest of the nation in the world of Scored, has fallen on extremely hard times. What would you say Imani has in common with some of your own favorite female protagonists, and what sets her apart? Like all good protagonists, Imani has a big dream, or quest. In her case it’s to go to college, study marine biology, then return home to save the dying fisheries and shoreline. What gets in her way isn’t so much the evil actions of Score Corp, but her own conflicted conscience. I’m always drawn to protagonists whose make-or-break moments hinge on an internal realignment of their own morality. I think of Katniss choosing to sacrifice her own life to protect her sister. The whole Hunger Games trilogy hinges on this essentially moral plot line, which I think elevates it above many other dystopian stories. The risk with dystopian fiction is that you make the world itself so dark that the protagonist can only ever be seen as a sainted victim. It’s much more interesting when the protagonist’s own morals are engaged. Scored is very interested in exploring how race, class, and other kinds of privilege determine people’s access to higher education and jobs. How did these issues shape the way you wrote the novel’s characters? No matter what the rules of the underlying world are in a story, race, class, and gender are going to impact how a character navigates through it. Imani, being mixed race, lower working class, and female, experiences this dystopian world very differently from the way Diego, who is white, male, and rich, experiences it. Although Score Corp hopes to eradicate privilege by subjecting everyone to ubiquitous surveillance and high stakes testing, I don’t believe humans will ever desist in their attempt to game the system. Privilege always finds a way to preserve itself. Perhaps we will evolve beyond using race and gender to rank each other. But I doubt we will ever move beyond class. In your novel, Diego argues that history shows that “People have a natural tendency to rank themselves.” Do you agree? I absolutely agree. When you remove one means of ranking, humans will find another. I’m not sure it’s in our nature so much as fixed into our culture, but I do not see it as changeable, at least in the near future. I should point out that it’s not inherently wrong to rank people. When choosing a dentist, you want the best one, right? The true hazard is believing that any ranking system is infallible or comprehensive. You are more than your GPA, SAT score, or rank in class. Scored really locks into the incredible pressure felt by so many young people today—the sense that in order to be competitive and get into college, they have to have perfect grades and test scores, excel in extracurricular activities, and associate with the “right” people. What do you hope readers feeling this kind of stress—as well as older readers—will take away from the novel? Honestly, I hope the book inspires a lot of discussion. I hope it frightens them, angers them, and makes them question everything. This book is not intended as any kind of consolation for teens. But on a personal note, as a grown up, I’d additionally like to tell them that they really shouldn’t worry so much about where they go to college, what their grades are, or any of the other status markers the world keeps throwing at them. When they reach middle age and beyond, their happiness will derive from totally immeasurable things–like how many close friends they have, what kind of relationship they have with their kids, their health, how often they call their parents, etc. We, as a society, are doing teens a great disservice by persuading them to worry so much about status. Status is a con game. It means nothing in the end. When can fans look forward to the next installment? Actually, I’ve just finished a novel, which is sort of a prequel to Scored. It’s set in the present and involves the earliest phase of the scoring system as tested on the inmate population of an experimental juvenile detention facility. It’s called Ashland, but I don’t have a publication date yet. 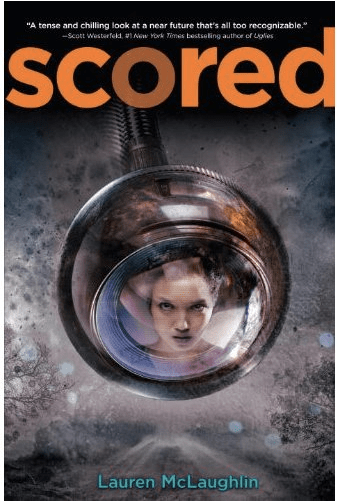 Is there anything else you want to say about Scored, or questions you’d like to ask readers? I’d love to ask readers what they think they would do if they were in Imani’s shoes. Would they give up their best friend to salvage their future? Or would they remain loyal? Also, I’d love to know whether they’d ever faced similar moral dilemmas in their own lives. Any GLGers interested in doing an online, book-club follow-up to this post to more directly answer Lauren’s final question? Sounds like a great read! Would love to be a part of that! Definitely a must-read for me (and more importantly my students). Hi there. I’m sure you’re more than capable of sparking discussion on your own, but I thought I’d draw your attention to this discussion guide that a teacher created for Scored. Feel free to distribute it as you see fit. Thank you, it’s always a pleasure to collaborate. Is there a way to send you a private message? That’s a great idea, Sarah! Count me in.